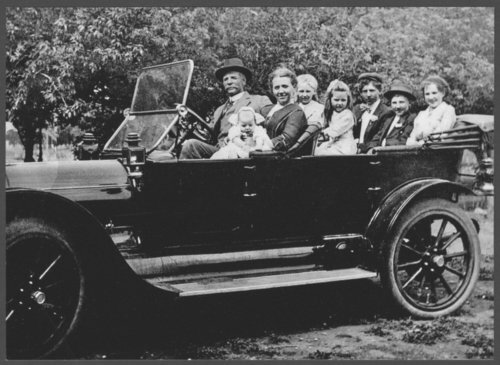 This is a photograph of Peder Pedersen Hammer and Anna Cecelia (Tosseland) Hammer with their family. Family members are: front seat (left to right) Peder Pedersen Hammer (1864-1947), Anna Cecelia (Tosseland) Hammer (1872-1969), Norman Lyle Hammer (1912-1980) being held by Anna; second row Bertha Irene Hammer (1904-1990) and Alma Alvina Hammer (1907-1919); back row Phillip Ingvald Hammer (1894-1976), Porter Alfred Hammer (1898-1982) and Nellie Blossom Hammer (1896-1994). Peder came to Kansas with his mother in 1872 and joined his father who moved to Norway, Kansas. Anna's parents were Norwegian, she was born in Illinois and came to Kansas with her parents.